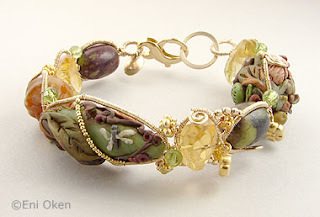 My fellow jewelry maker Sheila Hobson creates these wonderful polymer clay miniature sculptured beads. A long while ago, she generously sent me a batch of matching beads, which I had planned to use in my YOJ projects. 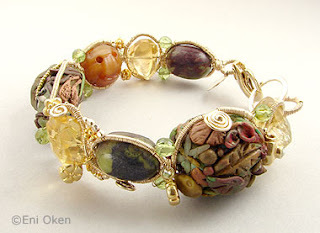 I finally got around to making a coiled bangle for her, using her polymer beads coupled with citrine and carved stone beads, all wrapped in goldfilled wire. Notice the tiny carved leaves and dragonfly, soooo tiny. I hope she likes the bangle -- thanks, Sheila! Better late than never -- now if I can find some time to make some jewelry for myself with the rest of the beads... that would be great!